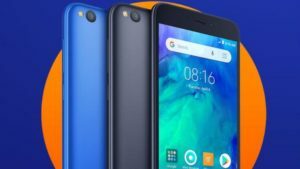 Redmi has unveiled a new smartphone that they call Redmi Go. The phone is an expected Android Go based phone, the company has yet to confirm this. The company says that the phone will have a 5-inch HD screen and a quad-core Qualcomm Snapdragon Processor. A leak said that the phone will use the Snapdragon 425 SoC, which is an entry-level processor. The company is still going to announce its launch date and pricing, but reports suggest that the phone will be available in the market by next month. The Redmi Go will have a 5-inch HD screen and will be powered by a quad-core Snapdragon SoC processor. The phone’s battery is a 3,000mAh battery. The rear camera will use an 8-megapixel camera that will have a LED flash with it, and a 5-megapixel front camera. The operating system of the phone has not been named yet, but according to some reports it is going to use an Android 8.1 “Go Edition”, this will be the first Android Go phone that will be made from the company. Redmi did not share anything regarding the phone, but if you look at a tweet they made, the phone will have 2 colors, which are Blue and Black. There is no assurance with the details of the phone and in which markets will the phone be offered. The company is yet to announce its prices and other official specifications. A leak suggests that the phone will have 1GB of ram and 8GB of internal storage that can be expandable by using a microSD card. The phone is believed to have a quad-core Qualcomm Snapdragon 425 SoC, which is an entry-level processor. The phone is also rumored to have dual-SIM support, Wi-Fi, Bluetooth 4.2, 4G LTE, and a micro-USB port for its charging purposes. The phone is rumored to use Android 8.1 Oreo the “Go Edition”. The leak also suggests that the smartphone will be available in Europe by February and will have a price of EUR 80 which is around Rs. 6500 INR. The phone was also seen registered in a retail website called “Lazada” in the Philippines, it showed the same specifications.